The Work of God is structured around the communal celebration of the Divine Office, or Liturgy of the Hours, which itself structures the monastic day. In fact, it is the deﬁning ‘work’ of the Benedictine monk. 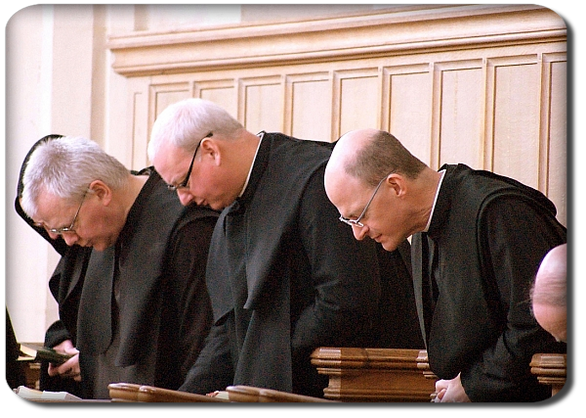 At Douai, the psalms, hymns and canticles of the various offices are all sung. Most offices at Douai are sung primarily in English, except for Vespers which is always sung entirely in Latin, using Gregorian chant. The monk strives to recognise that he is always in God’s presence in this life. This recollection of God’s veiled presence is part of his preparation for that day when he will abide in God’s presence forever, seeing Him as He really is. The monastic office is, at its heart, a spiritual experience, and something more than a performance. St Benedict sets great store by the reality of God’s presence in the Divine Office. Just as the monastic day is framed around the Divine Office, so too the Ofﬁce itself is ordered to the supreme act of worship, the Sacriﬁce of the Mass. The Ofﬁce is a sacrifice of praise which elaborates, in the life of the Church, the perfect praise of the Eucharistic Sacriﬁce. 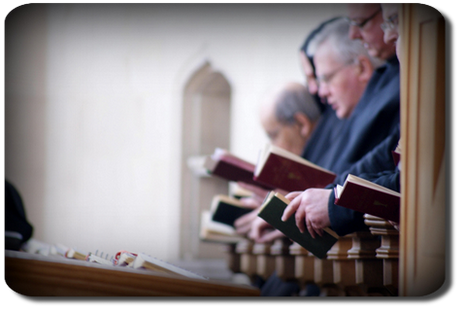 Central to our celebration of the Mass is the reverent prayerfulness of Gregorian chant. We also have a lay choir, the Douai Abbey Singers, which regularly contributes to our worship, especially on the greater feasts. You can pay a visit to their page - new singers are always welcome to apply to join.